Thanks to several cups of coffee and a brisk walk in the 32 degree (but sunny!) weather here today, I am definitely feeling more 'with it' now. Not coincidentally, the sugar rush called Thanksgiving has finally tapered off and I've purged the refrigerator of any lingering pie, tarts or cheesecake to avoid further temptation and sugar-induced headaches. Besides, she said optimistically, Christmas cookie baking will be firing up soon enough. I wish I could say I made this beautiful jewelry but I only took the photos. 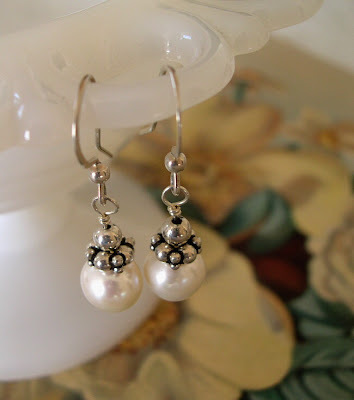 These pieces are handmade by etsy seller alicehaggerty using freshwater pearls and sterling silver. 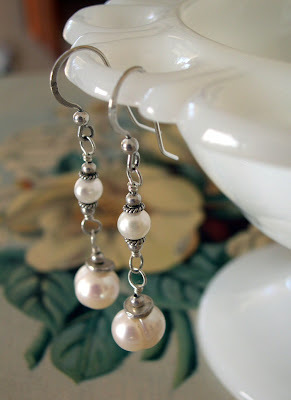 I wear these little pearl earrings all the time and had a 'situation' develop with them one rainy, muddy day. 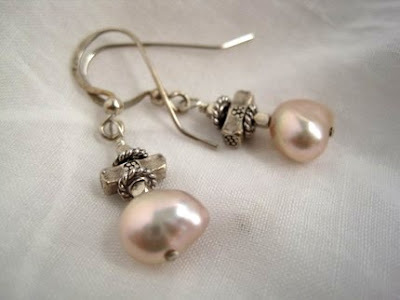 I knew better but was in a hurry* and didn't put those little rubber things on the ear wires, the things that prevent the earrings from coming out of your earlobes. I ran a bunch of errands and of course, by the time I got home there was only one lonely earring hanging from my empty head. I retraced all of my steps (*effective time management), including the one where I petted the neighbor cat in the earring-colored, mucky gravel driveway, scoured all the spots where I got in & out of the car, scoured the car itself and when I arrived at the last place left to look - ta da! - there was my earring! (at the reception desk of the vet). I am all about the rubber things now. 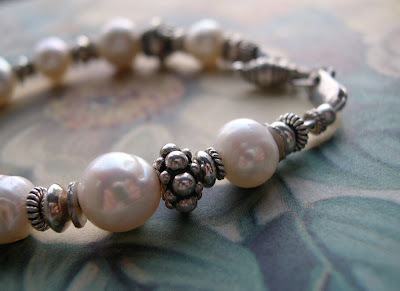 I don't know if Santa Claus is reading many blogs this time of year but if you are Santa, I love these pink pearls. Don't forget to check back on Friday for my ~*Giveaway*~. I'd have searched high and low for that earring, too. I hope Santa gets your message. In response to your comment - send the ticket, and I will be there in an instant to help you decorate! Aren't you just the luckiest gal to find your earring. What are the chances? I can't believe you found your earring! I'm with Barbara, I would have looked and looked until I found it. I would have cried and cried if I hadn't found it. I'm glad you're not crying! Very pretty! Those are going on my Christmas list! I love those pink ones too!! I'm glad you found your earring! I always see lone earrings laying in parking lots, and I always feel so sorry for the person who lost it! So glad you found yours. They're lovely!